You’ve got the rug you want. You’ve got the look you want. We expect you’ll want to keep it that way. Here’s our guide to helping you do just that. Protect entrances to your home with barrier mats to avoid getting dirt on your rugs. Think about having a ‘no shoes’ policy in your home. It’ll also protect hard flooring and carpeted areas. 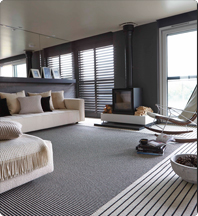 Use a non slip rug underlay made especially for hard surface flooring to prevent accidents caused by moving rugs. Try rotating your rug now and then to avoid constant use in areas of heavy traffic and exposure to direct sunlight. Never place your rugs on damp or wet floors. If your rug comes with a manufacturer’s care label, follow the guidelines and recommendations. Like carpets, all rugs benefit greatly from regular vacuuming, but what about the specific approach to your chosen rug? Shake your shaggy rug to loosen any grit or loose fibres. When vacuuming, use tools on the lowest setting to help to minimise any excessive shedding that’s sometimes associated with these types of rugs. Use your vacuum in suction only mode without using the beater bar on the surface of your rug. When cleaning this type of rug it’s important to try to loosen any grit as much as possible whilst keeping the pile upright, so it’s best to use a vacuum cleaner with a beater bar. It’s also a good idea to vacuum the back of your rug from time to time with an upright cleaner allowing the beater bar to loosen any grit in the pile. You can then turn your rug back the right way round and clean again as normal. Use your vacuum cleaner on the suction only setting without using the beater bar. Make sure, if you are using the beater action that your brushes are just skimming the surface of the pile by putting them on their highest setting. As with carpets, you should never rub the surface pile of a rug. It’s best to try and blot the area, preferably with a dry cloth or white paper towel, making sure you don’t spread the stain further. Any heavy spillages should first be scraped up with a flat knife or a spatula. Are you sure the cleaning solution you’re using is compatible with your rug’s fibres? If not, spot test a small area of the rug first to ensure you won’t ruin the colouration. Finally, after cleaning the affected area, brush the pile back in the direction of the rest of your rug. If you’re in doubt about any aspect of caring for and cleaning your rug, consult the manufacturer or please ask at your nearest Carpetright store for more details.